Tenley "Ten" Lockwood is an average seventeen-year-old girl…who has spent the past thirteen months locked inside the Prynne Asylum. The reason? Not her obsession with numbers, but her refusal to let her parents choose where she'll live—after she dies. While I think Gena Showalter is one of the nicest and most approachable authors I read, I must admit that her books have always been hit or miss for me, rarely in between. 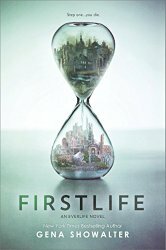 Which made Firstlife a really tough read at first. A friend and I were reading it around the same time and both of us had the same problem... it was hard to get into the story during the first 100 or so pages. This is some really complex world building and it's capped off with a heroine that's not very likable. As a reader I tend to love the unlikable women that other readers loathe but I found that with Ten it just made me struggle to care what happened to her. In turn that also left me feeling very disconnected from the romantic love triangle thing she finds herself involved in. I just wanted her to hurry up and pick a side already so the story could progress. I'm also the rare reader who loves love triangles, especially in YA, so the fact that I reached epic eye rolling over her torn feelings between Archer and Killian only made this a harder book to get into. My quibbles aside, I think the world building is really interesting. The near 500 pages wasn't even enough to get below the skin of it and satisfy my many questions and ponderings about it. While I didn't particularly like the characters or dig the romance, I think I'll give the next book a shot simply to see more of the world building fleshed out. If you hate love triangles and find extremely complex fantasy/scifi worlds daunting this is definitely not for you. I would recommend it to readers who are interested in religion and mythologies and those who find problematic, unlikable female protagonists enjoyable.